Episode 41: Interview With Day Trader Papa John. No, this episode is not about pizza. 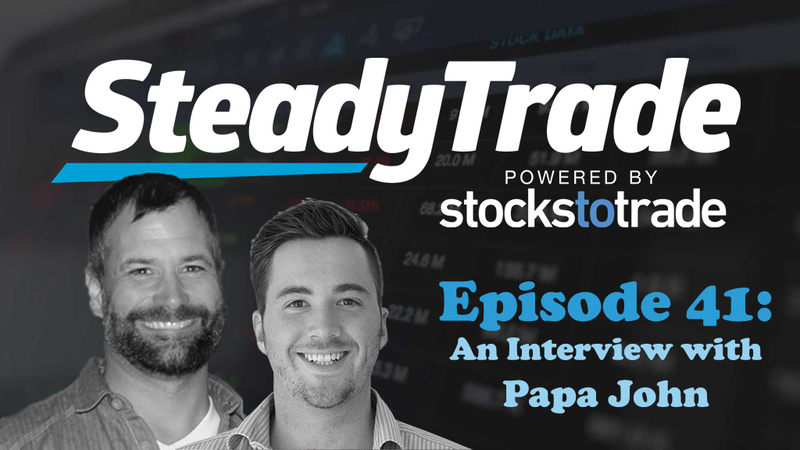 In this installment of The Steady Trade Podcast, hosts Tim Bohen and Stephen Johnson are interviewing a day trading phenom known as Papa John. Just about a year into his trading journey, Papa John has a remarkable story. After losing a whopping $16k in his first 6 months of trading, in the past 3-5 months he’s enjoyed an incredible turnaround, skyrocketing into the green. So what changed…and how can other traders learn from him? Listen to find out! Before Papa John was a day trader, he was a gambler. Initially, he was into online poker, but when the laws changed, his dreams were dashed. Then, he learned how to count cards at blackjack. He was finding success with that, but after his son was born he put that on the back burner, hoping to find something that would keep him closer to home. That’s when he discovered Timothy Sykes. In watching some of the famous trader’s videos, he decided to give it a go. He jumped into his first trade the same morning he set up his brokerage account and made some quick money. He thought: whoa, I’m going to become rich! Well, not so fast. After that initial win, he began to lose…and continued to lose. Over his first six months, he lost $16k. So what changed? Papa John began to gain his edge. As a poker player, he’d needed to find an edge before he found success. But once he nailed it, he was consistently profitable for 6 years. With counting cards, he also began to profit once he found his edge. So he began to apply the same principles to his trading and set out to find what his edge could be there. For one thing, he realized that while he was tracking his trades in a spreadsheet, he wasn’t keeping track of his setups. After learning that Tim Grittani swears by this technique, he began to and was surprised to learn what was actually making him money. By beginning to focus on the setups that were actually working for him, he was able to turn things around. Over the next 8 weeks, he made 33k from his lowest point. He hasn’t won every time since then but now, about 11 months into his trading, he’s definitely in the green. All Stephen wants to know is: Papa John, how did you narrow your edge? Well, in a few ways. For one thing, Papa John devoted himself to self-improvement. In admitting his weaknesses as a trader, such as risk management and determining position size, he gave himself the opportunity to improve upon them. This allowed him to become a far stronger trader. He also began to get even more specific with his setups. For instance, multi-day breakouts were good for him, so he began to break the breakouts down even further. In doing so, he earned that he was better at OTC breakouts which trend a lot better versus NASDAQ breakouts. In this way, he was able to get super focused on what works for him and improve his average. Papa John answers your questions! In the episode, Papa John also answers some rapid-fire questions from Stephen, some of which are from Twitter members/listeners. You’ll learn plenty, including what he does for a day job, what his biggest single loss was, how he kept going after losing so much money, and whether or not he named himself after the pizza chain (spoiler: no). Want to try out StocksToTrade? 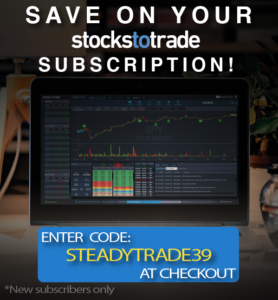 Want to save on your $39 off your first month of an STT subscription? Enter code SteadyTrade39 at checkout! Visit the “submit your audio” portion of the website to ask us anything. You may be featured in an upcoming episode! Where does Stephen do the podcast from? It looks like he’s in an office building. I’m a little surprised it’s not from a bar. WOW for a min there i though i was being interviewed. THANKS P.John. That was a lot of info that i need it. The one thing i still have problem wit is, when to exit a trade. I no to cut lost but I don’t no when is a good time to take profit. I always end up holding to long. Very good podcast boys. Authentic people and real stuff. So robots are ok but keep up drinking beer. Your belgian friend ! Good lessons. Excellent Podcast, was looking forward to this one as I always heard about papajohn on Tim’s video lessons and he commented a lot on him on how he was down so much and turned it around. I have made 7 trades and lost 6 but I am learning from every loss and on each one I have had a very small loss, as I am only entering small as well. Losing $67 in total. But very inspiring to hear from papajohn, not to ever give up, find what is working and stick to that to grow the account before trying new setups. Another fine job here. Great to hear from PapaJohn!!! Excellent advice!! Man I drive Trucks, Im really interested in learning this. How can I get involve? I am GREEN! I raley will have time to watch the market screems. Im just thinking what are my options. Im not looking at the glass half empty , Im looking at it half full. I believe I can do this! Here’s my schedules: Home every weekend, Start at 5- 6am Pick up load, drop; I usually shut down by 6- 7pm. Daily. I know there’s no guarantees but are the benefits for joining you guys? Another excellent podcast guys, You guests are down to earth, real and very inspirational. I know that if I keep with the process, trade small, go for small gains, trade the pattern(s) that work for me, consistent green days will come for me. Great episode as usual. Also, inspiring. Thank you guys!